Hunan province covers the river basins of the Yuan and Xiang rivers that both drain north-eastwards into the vast Dongting Lake and from there into the Yangzi River (known in China as the Chang Jiang). The name originates from its position south of the Dongting Lake (the second largest freshwater lake in China) which is on the flood plain of the Yangzi. The shortened name for the province is the river name ‘Xiang 湘’. 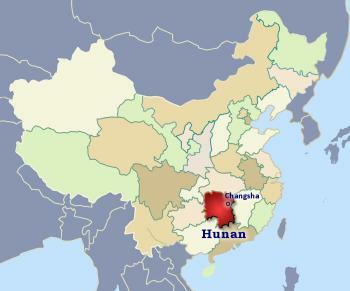 Hunan stands in the rich heartland of south central China surrounded by mountains. It has produced food to feed the northern provinces for centuries. The rapid growth of population in the 19th century led to famine, fueling support for the Taiping Rebellion and in the 20th century the Republican movement. Changsha (meaning ‘long sandbar’) is the largest city in Hunan and its history goes back 4,000 years, it stands on the busy overland route to Guangzhou, Guangdong. The Mawangdui ➚ museum in Changsha holds many archaeological finds from ancient times dating from the Spring and Autumn period onwards. The center piece is a marvelously preserved body of a noblewoman from 2,000 years ago. There is a legacy of foreign development which came when the city became a treaty port in 1903. It was one of the last cities to fall to Japanese occupation in 1944. Orange Island ➚ has a memorial to Mao Zedong complete with a carving of his poem called ‘Changsha’ celebrating his home province. The city has a number of other sites relating to Mao's life. Under freezing skies millions of creatures contend for freedom. Part of Mao Zedong's poem “Changsha”. Liuyang to the north east is famous for the manufacture of firecrackers - an indispensable part of any Chinese celebration. Up the Xiang river Hengyang is a large industrial city which also mines nearby mineral deposits. Mount Heng (or Hengshan the southernmost of two with that bear this name) is a famous Daoist sacred mountain with many temples dotted around the forested slopes. It is a popular tourist destination. The Nanyue Damiao (Great Southern peak Temple) has been rebuilt several times since its foundation in 726CE. The main hall has 72 pillars representing the 72 peaks of the Hengshan mountain range. Furongzhen is famous as the ‘Hibiscus Town’ of writer Gu Hua ➚. Wulingyuan Scenic Area ➚ (also called Zhangjiajie) is in the north west of the province, it is a large 243 sq miles [629 sq kms] forested and mountainous area. UNESCO ➚ has designated the area as important for its wildlife and astonishing rock pinnacles. Within the area are Huangshi Zhai (peak area), Kongzhong Tianyuan (Heavenly garden) viewing point, Xianren Qiao (Immortals’ Bridge - a narrow stone bridge over a chasm) and Tianzi Ge another viewing point. The area was made famous worldwide because the Avatar film ➚ was made here. Today I climb the Sunny Tower. Dongting Lake has for thousands of years acted as a buffer reservoir for the Yangzi when it is high in the late summer to prevent flooding further downstream. The lake can grow to seven times its size. 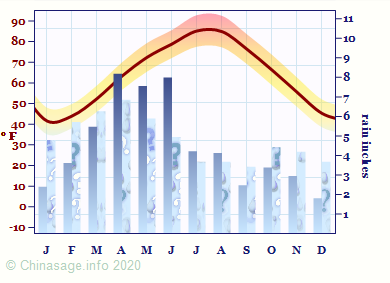 However with the Three Gorges Dam and increased water abstraction the lake has been diminishing in area. There is a mausoleum to China's legendary Emperor Shennong at Yandi Park ➚, Zhuzhou. Hunan (or Xiang) Cuisine is famous for its spicy dishes. Green Tea produced at Dayong and Yinfeng are highly regarded teas. Junshun Silver Needle ➚ tea, ‘The tea of Emperors’ is grown to the west of Dongting Lake on the island of Junshun. On this island grows a rare speckled form of bamboo, said by legend to be speckled from the tears of King Shun's widows. Shaoshan is famous as the birthplace of Mao Zedong and has many exhibits chronicling his early life there. His family still live there - about 60% of the population bear the Mao family name. Liling near the border with Jiangxi has kaolin deposits and with coal nearby was an ideal place to make porcelain. It has many kilns and produces pieces of distinctive design. Archaeology has given evidence for an advanced culture as far back as the Shang dynasty. During the Five Dynasties it became, briefly the kingdom of Ma before being absorbed into the Tang empire. It then became a vital source of food (mainly rice) for the cities of the north, Qu Yuan met his death in the Miluo river north of Changsha, and the Dragon Boat Festival (Duanwu) marks this event throughout the world. The mountainous fringes of Hunan are home to a number of minority people: Miao; Tujia; Dong and Yao, but most of the rich lowland area has been settled by Han Chinese since the Warring States Period. During the Qing dynasty friction with Han settlers led to a series of Miao Rebellions ➚ which were brutally put down. The Hunan people are known for dogged resistance, they held out against the Taiping rebels with the help of Zeng Guofan's ‘Hunan Braves’. Liu Shaoqi, one time Chairman of the Communist Party, was also born in the province at Ningxiang. Another Hunanese who fell into Mao's disfavor was Peng Dehuai ➚. Hu Yaobang was also born in Hunan. In 1928 the Communist Pingjiang Uprising ➚ took place in Hunan against the Guomindang. It has in the past provided more rice than any other province. The rich land is in the east while the mountainous west remains sparsely populated by mainly ethnic peoples (Tujia, Miao and Dong). Timber is a major crop of the western part. There are large deposits of coal in the south. By many statistical measures Hunan is an average province, so it typifies the whole of China which befits its central geographical position. 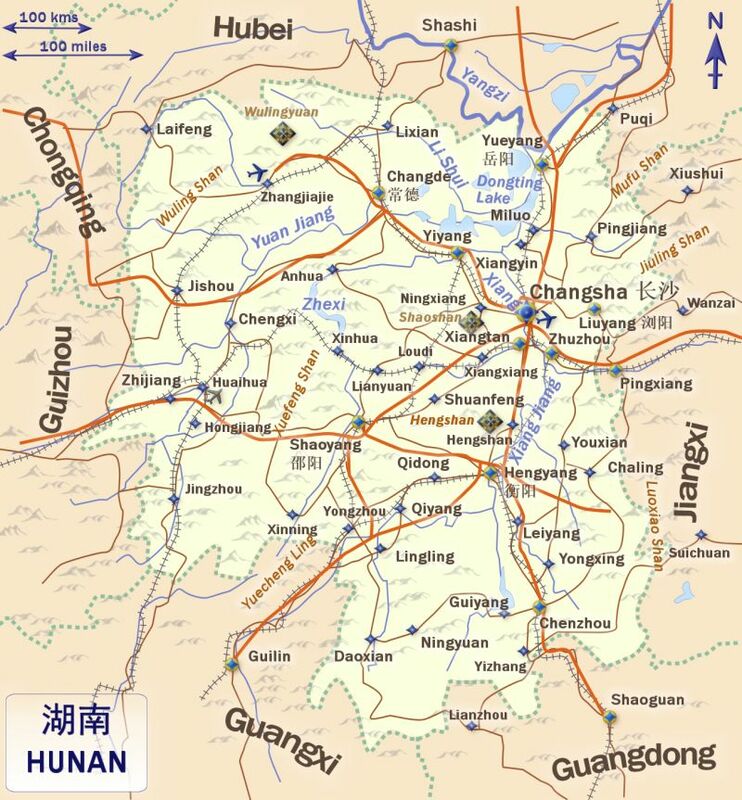 Citation information for this page : Chinasage, 'Hunan, China', last updated 27 Nov 2018, Web, http://www.chinasage.info/maps/hunan.htm.